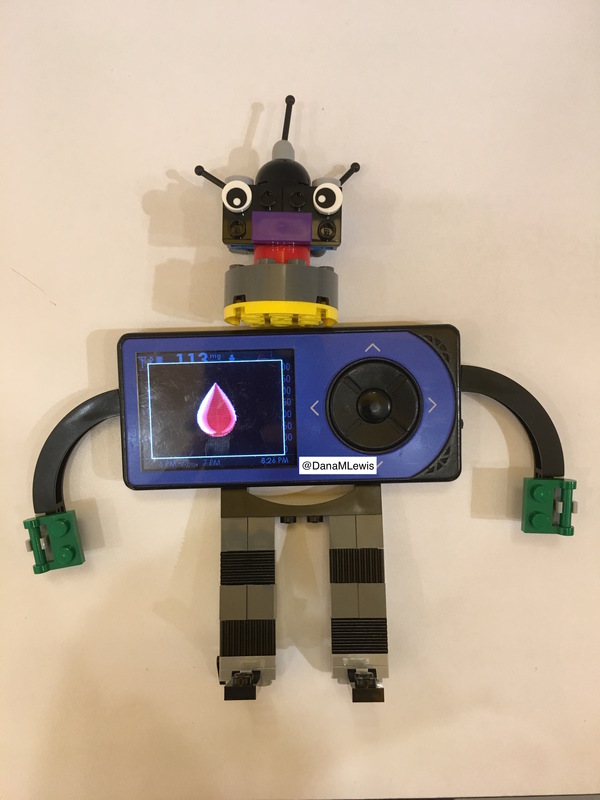 When I wrote my first book for kids about diabetes devices, I had an idea that I might write more kids books for my nieces and nephews. 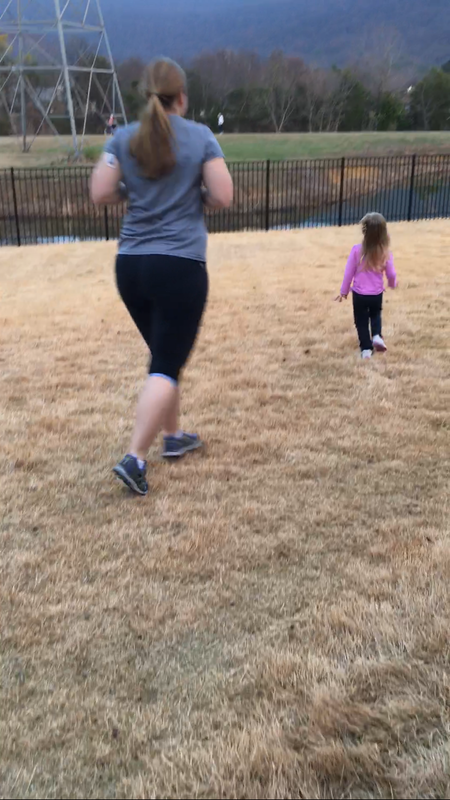 While my first book was inspired by a verbatim conversation with my niece, my next book is inspired instead by a cute story of my nephews, combined with a burst of frustration about living with celiac. 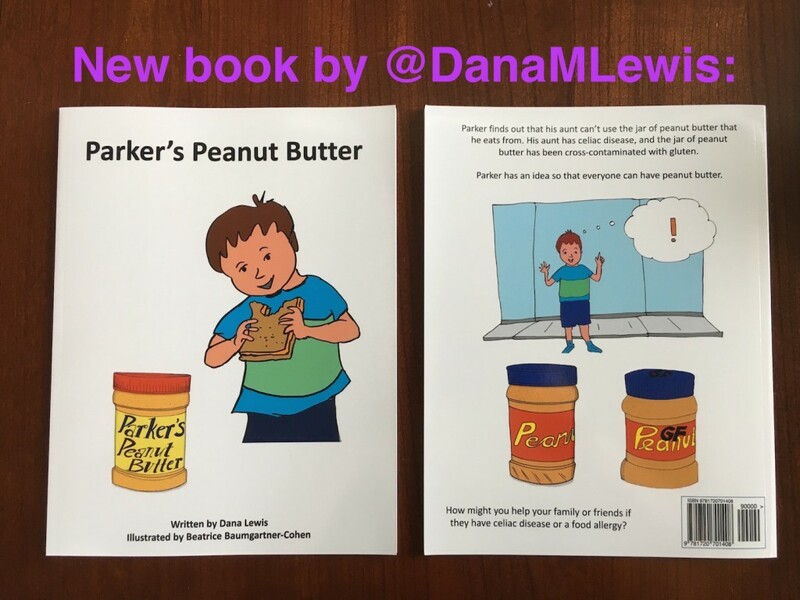 This new book, “Parker’s Peanut Butter”, wrote itself in my head while I was on a trip in Germany. The hotel I was staying at, despite many early communications about needing safe, gluten-free food, did not get gluten free at all. Being told “this dish is ‘usually’ gluten free” was incredibly frustrating. That night, I began drafting this story to help explain celiac – and cross-contamination – to kids. The next day, with the book top of mind, I was at a meeting where artists had been hired to help document and crystallize some of what was happening at the meeting. I had seen some live illustrators before document various sessions at conferences, but these two artists were in a class of their own. They did such an amazing job capturing the key themes, quotes, and their illustrations were simple yet effective – and incredibly quick on the spot. I was in awe. I had an idea that wow, if someone like them would illustrate my next book, it would probably be fairly simple for them to do two dozen illustrations. (And yes – I know it is their incredible skill and artistry that makes it possible for them to do “quick” and “simple” yet incredibly powerful illustrations!) But, this is a zero-budget project: for every two books purchased, that yields enough for me to purchase an author-priced copy to donate to hospitals, libraries, school libraries, etc. I knew there was a really slim chance that other artists would be interested in contributing art to my book. (My amazing aunt was gracious enough to illustrate my first one! <3) However, you never get a yes if you don’t ask. So I crossed my fingers and approached the artists, explaining the project and showing them my first book. They seemed at least open to the possibility, so I promised to email and follow up after I got home. I emailed when I got back, and Beatrice said yes to illustrating! I was thrilled. And so “Parker’s Peanut Butter” came to fruition. The story about the peanut butter and the hot tub is true (which I think is/was hilarious). I combined it, though, with a conversation I had with Parker about celiac from one time when he wanted to know why I wasn’t eating the other pizza on the table. Like the diabetes devices book, I used simple tools (Microsoft Powerpoint!) to lay out the book and CreateSpace to publish it. (You can read here about the exact process I took to create & publish the book). I hope this inspires others to consider writing & creating more books with characters living with chronic conditions like diabetes, celiac, food allergies, and more to have diverse representation of the challenges we all live with. PS – if you’re an artist & interested in helping illustrate a future book, please let me know! I’d also love to hear what stories & perspectives you’d love to see in future kids books, if I write more. As I mentioned when I wrote about the process of writing my children’s book about diabetes devices and how all people are different – I had to keep a lot of secrets. The topic of the book was a surprise from my mom. The fact that I wrote a book at all was a secret from my brother, sister-in-law, and niece. 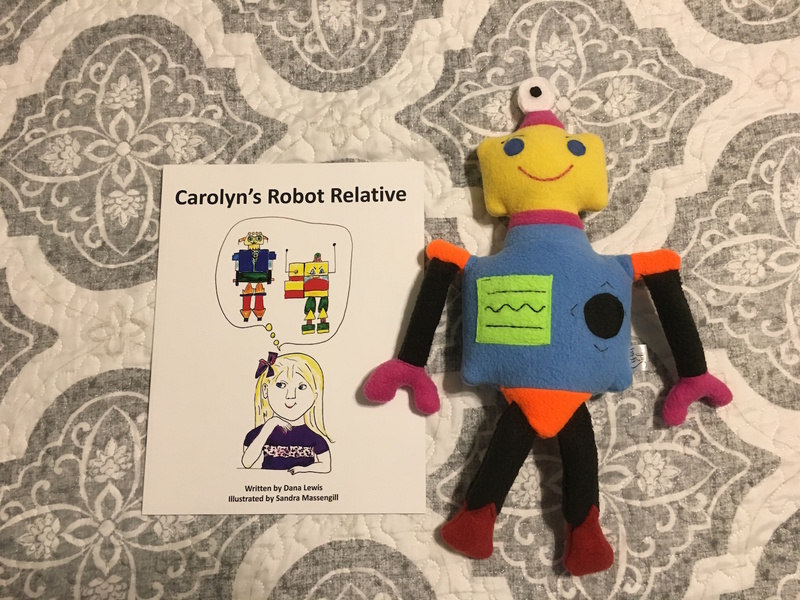 As I started to add other fun things, like turning the CGM-robot into a “stuffy” (which you can get on Etsy), I also wanted to do something special as a surprise for my aunt. After all, she is the one who donated her time and her efforts for the beautiful illustrations in the book! 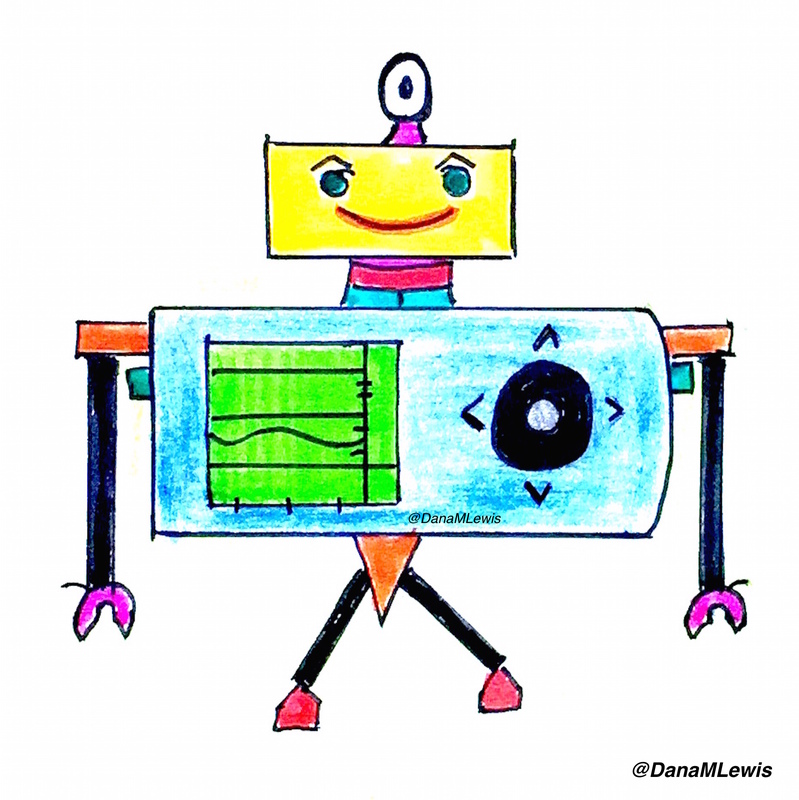 I love the CGM robot so much, because it’s such a cute illustration, and it also was something that was 100% my aunt’s idea (I just asked for some kind of illustration for the opening page, and it’s totally her creation). 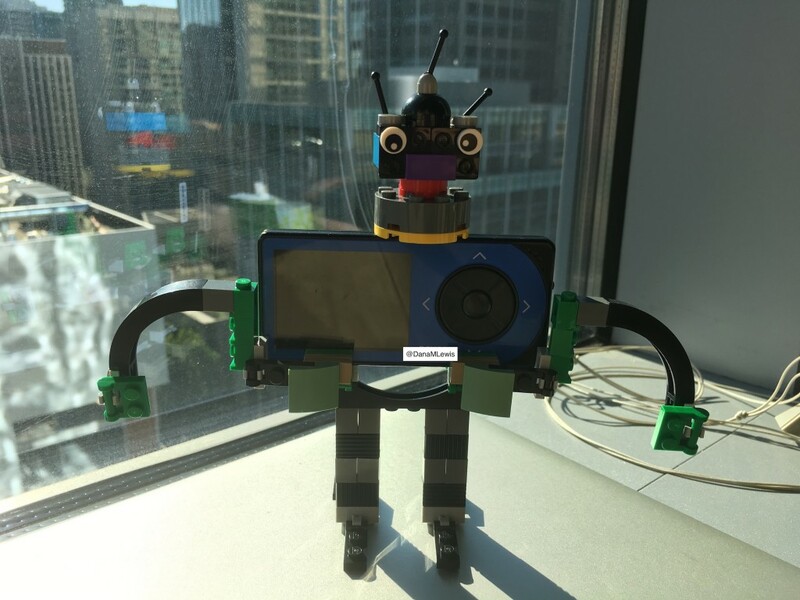 So when I was speaking at an event and they happened to be giving out found-object robots as awards, I knew I had found my gift idea. So, I almost immediately tweeted and began looking for a dead/broken CGM receiver. I had to be vague about it, though, given the topic of the book being a secret for my mom. I told the people who were reaching out with offers of busted receivers that this was for an “art project”, not hacking, so they didn’t get their hopes up about anything else! I had reached out to the creator of the found-object robots, but she wasn’t available until January. Ouch. I knew that timeline wouldn’t work. 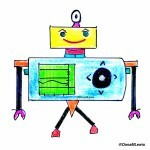 I started thinking if maybe I could find someone local to help me create the robot. Then Scott had the idea of trying to do it with Lego’s. So on a cold, rainy, typical Seattle Friday night, off to the Lego store we went! Let’s just say, an adult couple without kids is not the typical Lego store customer. However, I started poking around at the bins of for-sale Lego pieces, looking for pieces to help build the shapes that I wanted. 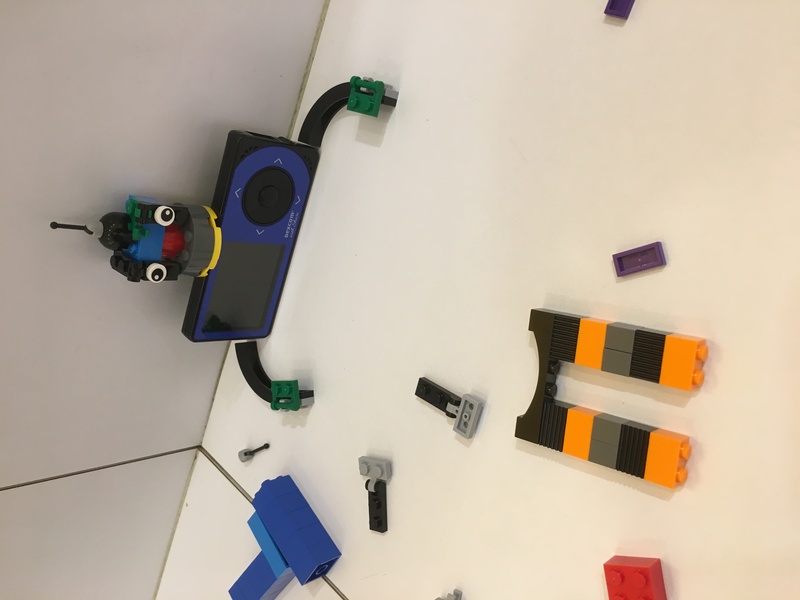 The Lego store employees sidled up and said, “do you mind if we ask what you’re making?” and also began to help scout the right size and type of pieces after I showed them the illustration of the CGM robot. We bought a container of Lego pieces, plus some spares because why not, and brought them home. I played around with my receiver (blue) while I was waiting for the broken receiver someone had kindly donated to arrive. 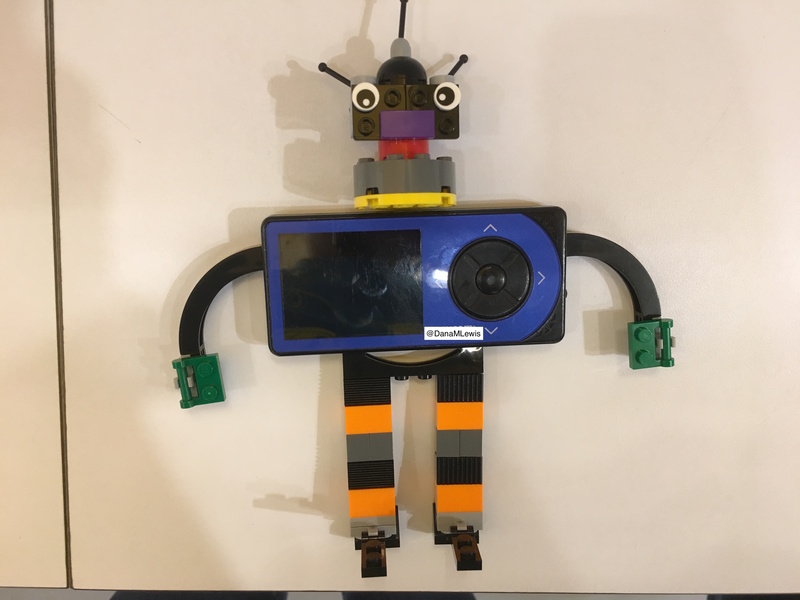 Then the broken receiver arrived, and the robot was finished! 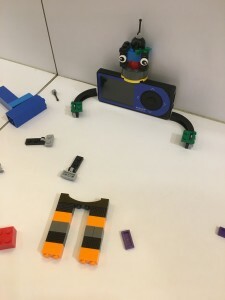 While the Lego store will never ever tell you to glue Lego pieces, our helpful Lego store staffer passed on what other customers have told him for keeping pieces connected – a bit of super glue. So we (thanks, Scott! ;)) used super glue to attach the receiver to the back support piece and for all the major joints, so it wouldn’t fall apart in transit. When I went to see my family, taking the books and the stuffy, I also took the robot in bubble wrap, and sent it home with my mom. 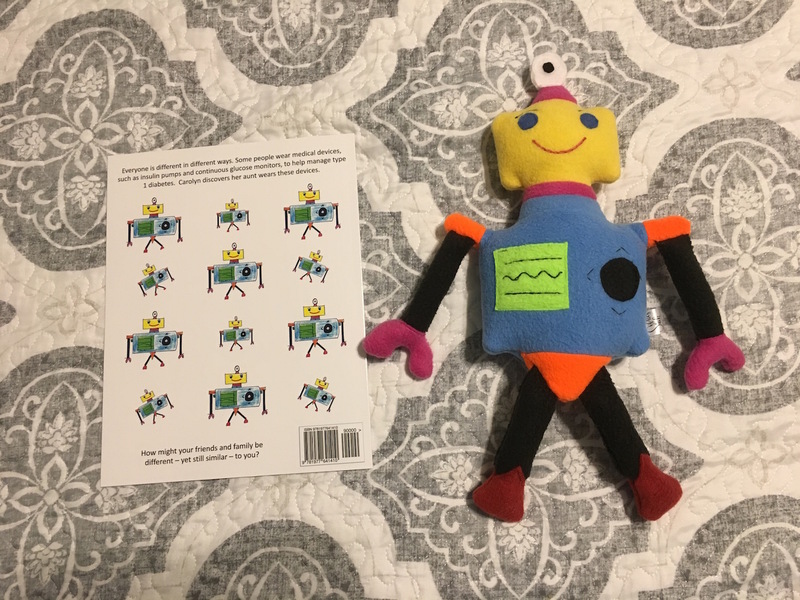 My mom went to take the signed copy of the book to my aunt today, and surprised her with the robot! So, the last secret is out :). Last year after Christmas, I was running around my parents’ backyard with my niece when she spotted my CGM sensor on my arm and asked what it was. 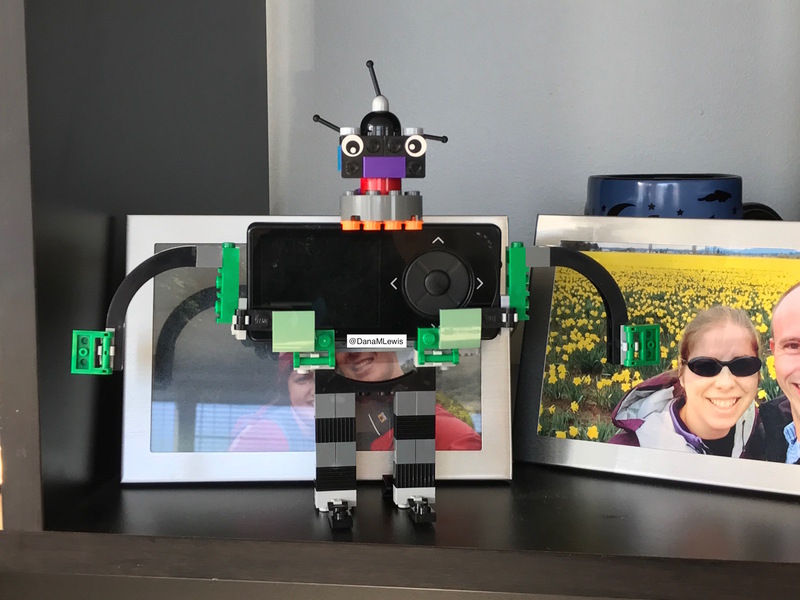 I’m always struck when my niece and nephews have noticed my diabetes devices, and am interested to see what “new” humans think about and how they encounter things and what they mean. In this case, I explained the CGM and we went back to running around, but it stuck in my mind for a few days. I also remember the excitement and attention any time a kids’ book has a character with diabetes in it, or a storyline of diabetes, because there’s just not much out there. I was diagnosed at 14, but I love seeing PWDs in the wild and like the idea of more diabetes inclusion in materials for all ages. 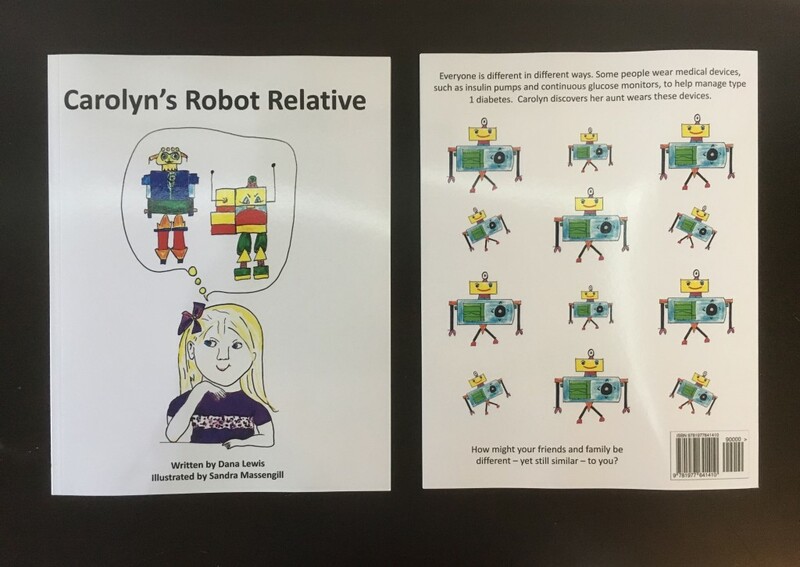 So, I wrote a kids book, with the goal of introducing the concept of diabetes devices and more broadly, how people are different in different ways. I talked my incredible artist aunt into illustrating this book. The cheapest copies for me as the author, to be able to give to my various family members who want them. The ability to make it available to other people who want copies. The ability to price said copies so it’s accessible and reasonable to order easily. Every two copies purchased via Amazon yields an author-priced copy that I plan to donate to libraries, hospitals, etc. (If you’d like to sponsor 10+ books for a library system, feel free to ping me about the easiest way to do that.) I’m planning to use any “profits” from the book to pay for copies that I’m donating. The stuffy with the book – it’s an awesome sized stuffy! 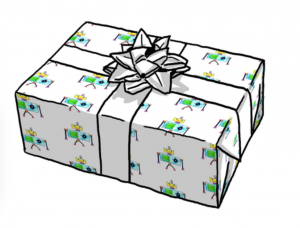 And because I have also been playing with code fabric on Spoonflower (see tweet thread here, or this blog post here) and know they do fabric as well as gift wrap…I uploaded the CGM robot there so I could turn it into wrapping paper, too. 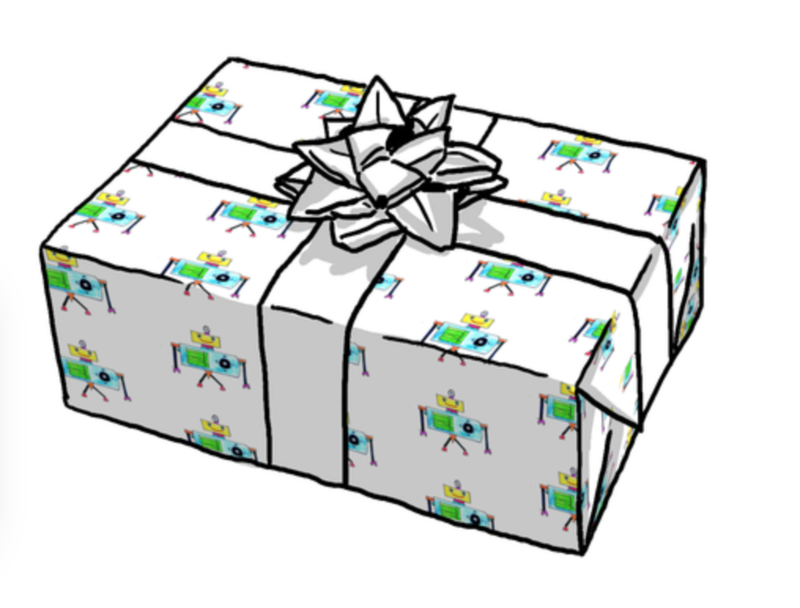 Here’s the link to see it on Spoonflower. I learned a lot in the research process about self-publishing options and the route I took that I wanted to share here, especially for anyone who sniffs and goes troll on me about putting this out there. *Tl;dr – self-publishing is easy, and if you don’t like my book, go make a better one yourself! The more books, the better! I chose self-publishing with CreateSpace on Amazon. They now have this new “Kindle Direct Publishing” (KDP) program that’s similar, but less tested than CreateSpace, and seems to be higher cost for author copies. I never figured out what the benefits are of that, and chose CS. I generally Google’d a bunch of questions and ended up on the CS forums, too, and read up on different programs to use to create the book, etc. I wrote the book test in Microsoft Word, then translated it into a Google spreadsheet so I could visualize the left/right layout of the flow of text, as well as start to identify where I had ideas about what images to use. I started dropping them into a Microsoft Word document. The one thing the CS forums warned about was making sure the images were high enough res. The images were…but later in the upload process, it complained about the DPI being low. I switched to Microsoft PowerPoint (doing the same thing I did in Word to create the custom page size to work with bleed, trim, etc.) and dropped the images in the same way, and PPT doesn’t compress the images and it was fine. Word was problematic. It didn’t take much time to switch back and forth, but if I did it again, I’d start with PPT because they generally seem to get that images need to be full sized. (A workaround if you take screenshots and need to insert images – you can use Preview to go in and adjust the size and make it >300 DPI that CS prefers, before inserting the images into PPT). I placed text boxes on top of the images. Once done, I saved as a PDF, and then went to upload to CS. I uploaded and tweaked and viewed the Digital Proofreader tool about a dozen times the first day I did it, as I wanted to move text a tad up or down, and as I resolved the complaints about DPI not being great. Once you’re happy with what’s uploaded to the system, you submit to CS for review (takes 24 hours). You then get to review another digital proof, and a PDF version, and then get the chance to order a physical proof copy! Tl;dr version 2 – it was actually super easy, even for someone who’s not a graphic designer, to do this. This was a great method to work with an illustrator with simple iPhone photos of awesome illustrations and turn them into a book. You could probably also scan and do all kinds of fancy stuff…but for a basic book, the basic process described above works great. It actually doesn’t take much time in terms of placing text or uploading and tweaking your file. The hardest part was calculating the size of the pages and deciding on whether to do with bleed or without bleed. The other hardest part was keeping the topic of the book a secret from my mom for 10 months, because I thought she’d get a bigger kick out of being surprised with the book’s topic and contents when she had a finished copy in her hands. Sorry, Mom! Hopefully you thought it’s worth it.